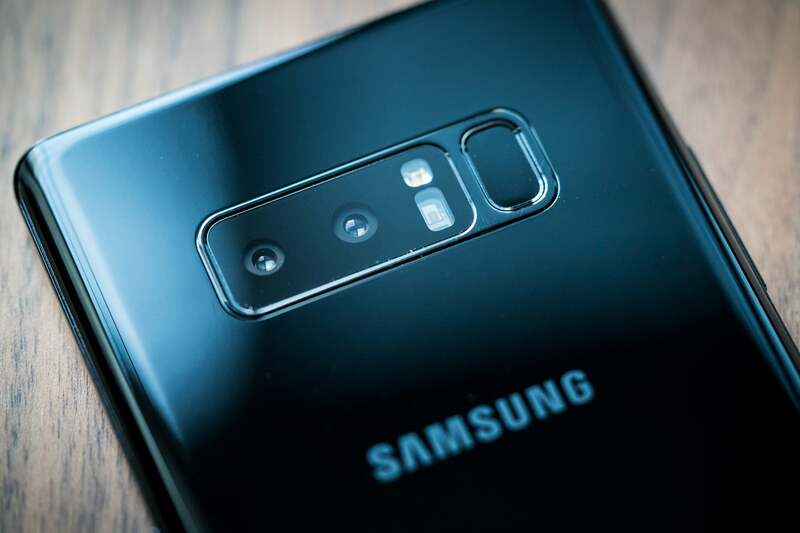 Hot off the presses is the Galaxy Note 8, Samsung’s latest flagship phone, and it sports a dual camera system—a first for Samsung. 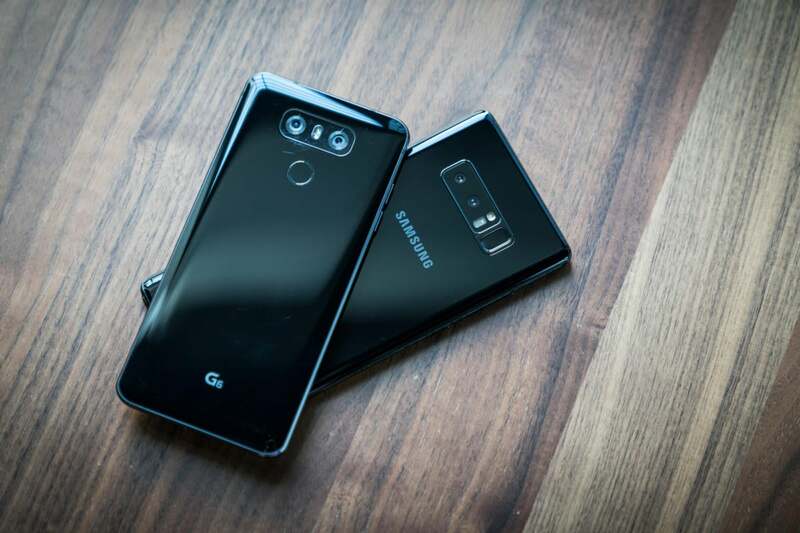 The Galaxy S8, released in May, wasn’t able to topple the LG G6, our current pick for smartphone camera dominance, and so we’re interested to see the changes Samsung has made to its camera tech in the past six months. Can the new Note 8 beat the LG G6 where the S8 fell short? Keep reading to find out. 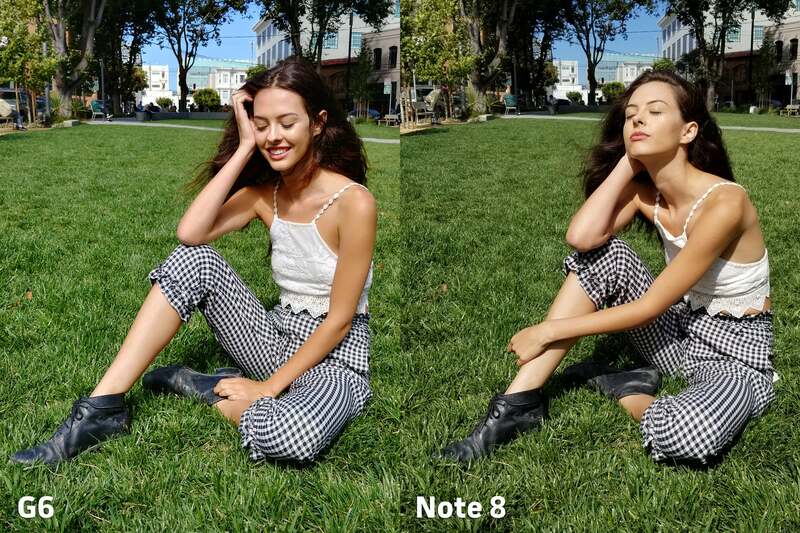 LG's G6 versus Samsung's Galaxy Note 8. Camera fight! Before we dig deeper into the results, let’s review some specs. 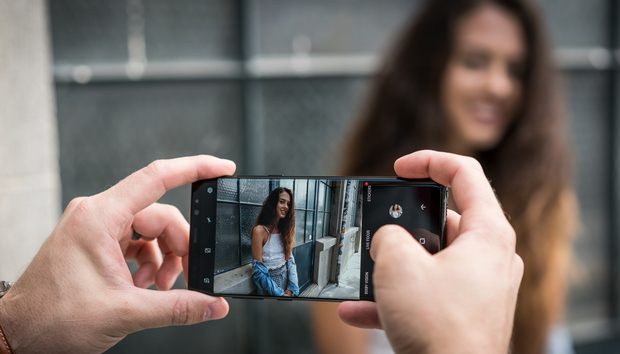 The Note 8 is the first Samsung phone to have a dual lens setup, with both cameras rocking 12-megapixel sensors. The main (or "wide") lens has an aperture of f/1.7, while the telephoto is a slower f/2.4 lens. 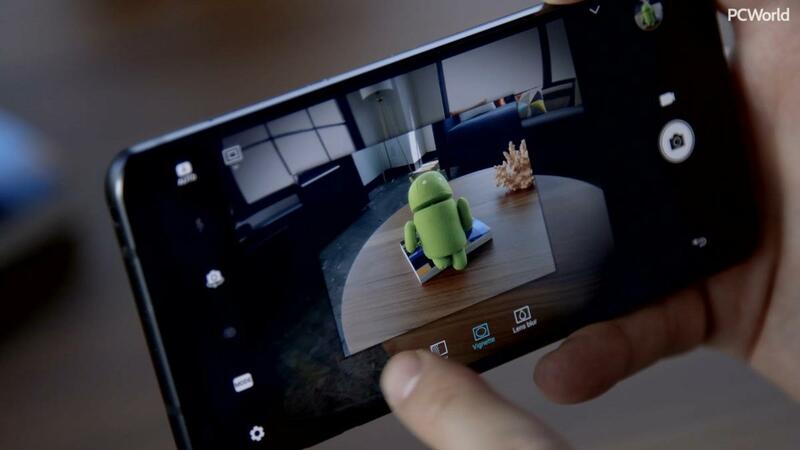 And in a first for any smartphone, both lenses have optical image stabilization, or OIS. The Samsung Galaxy Note 8's dual camera system. The G6, meanwhile, features a fairly typical main camera paired with a super wide lens. Both sensors are 13 megapixels, with the main shooter’s aperture set at f/1.8 and the wide's at f/2.4. Only the main camera has OIS built in. You typically don’t need stabilization with wider fields of view, though it would've been nice. 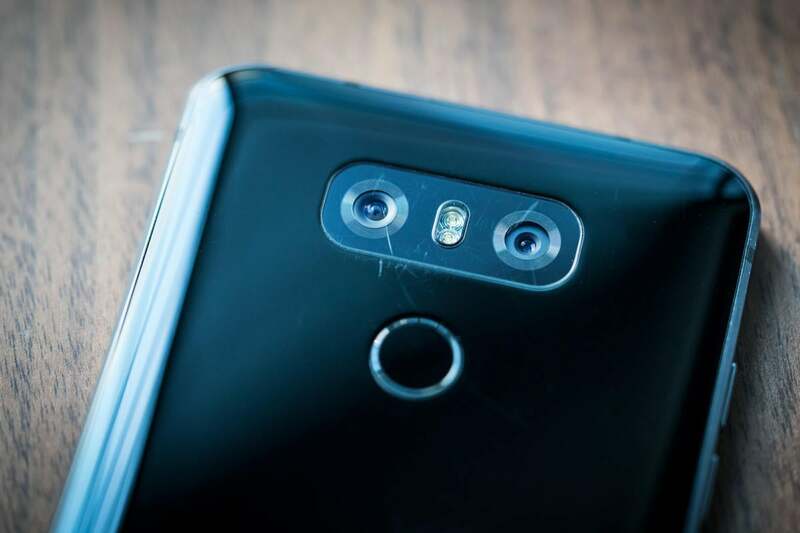 Despite some wear and tear the LG G6's dual camera system has been unstoppable this year. 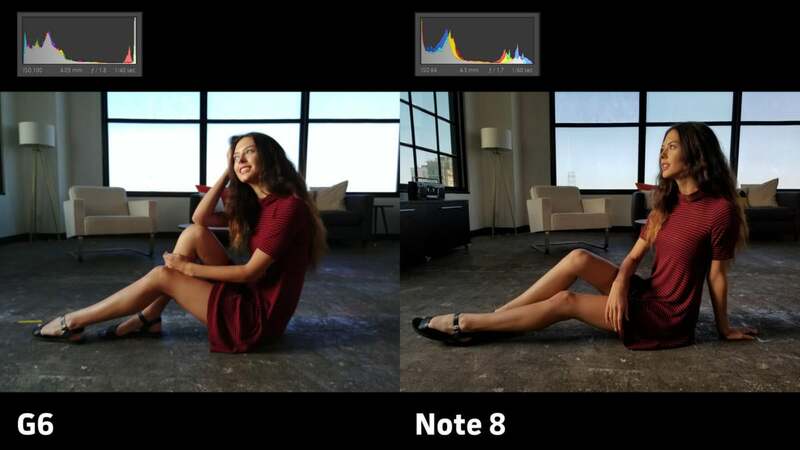 But specs are only one slice of the pie, as it often comes down to how each phone handles post processing. In this shootout, I’m going to focus mostly on the results from the main cameras for both phones. The testing categories will be broken into four sections: color, clarity, exposure, and user experience. 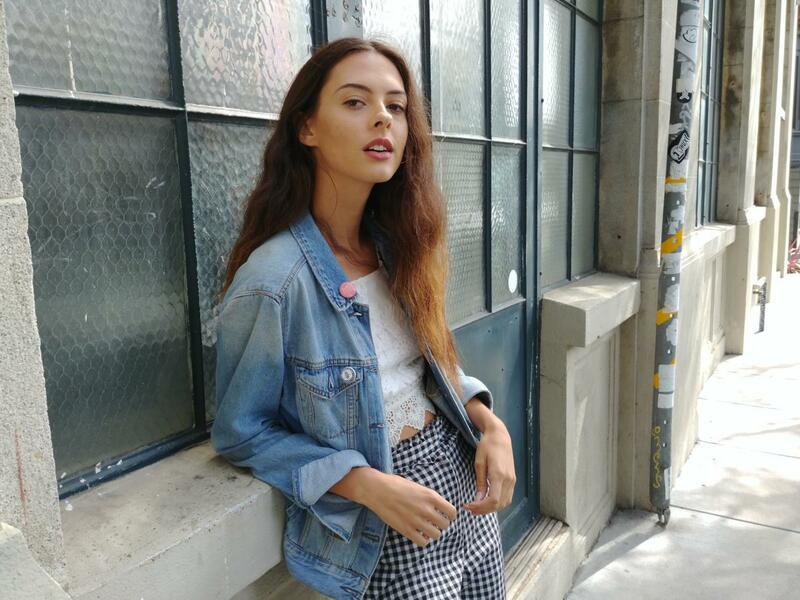 For this showdown, we hired the amazing model Cyndal to help us capture some real-world scenarios in San Francisco. 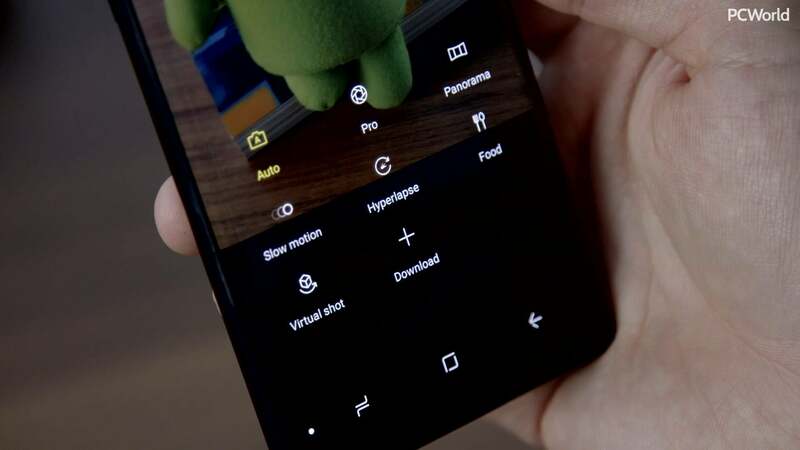 The first category is color and what I’m looking for here is how each phone handles white balance, saturation, and color reproduction. 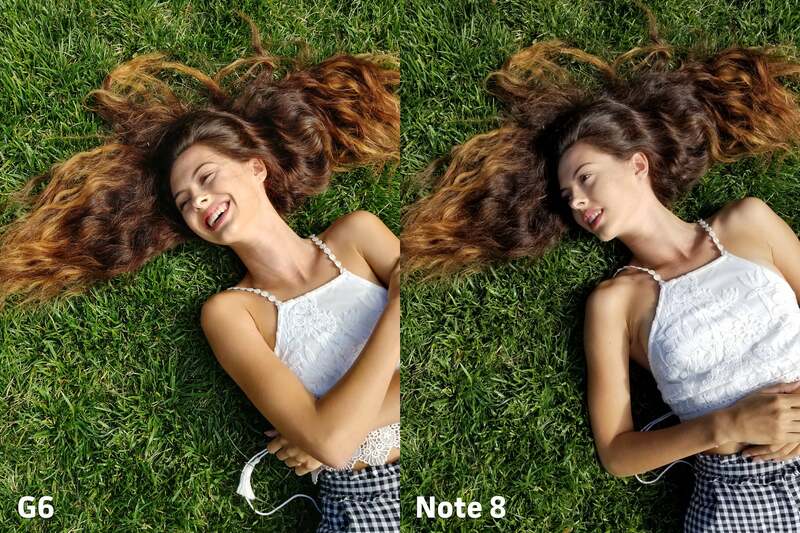 In this first example we see that the G6 casts magenta hue on skin tones, whereas the Note 8 favors a greenish tone. 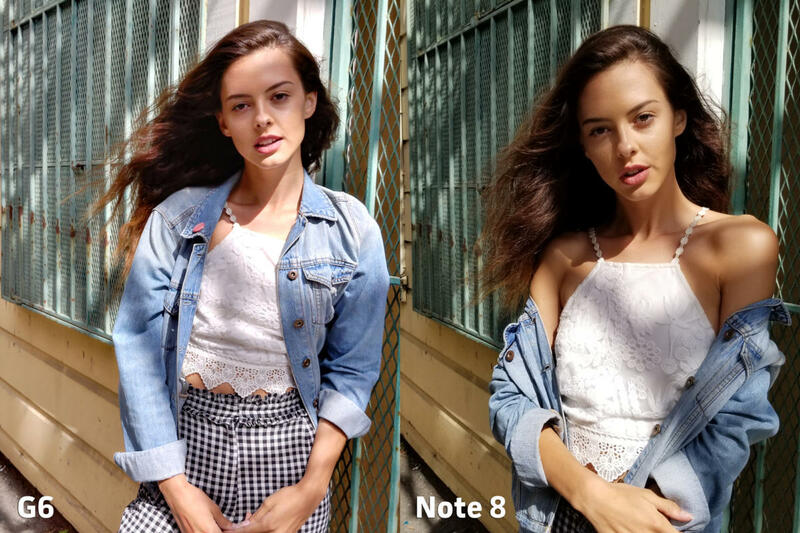 In this street scene the Note 8 warms the highlights and the model's skin. In this grassy scene, the greenish hue from the Note 8 doesn't stand out as much as the magenta on the G6. Now if you’ve been following this shootout series for a while, you might notice some similarities between the Note 8’s and S8’s results. 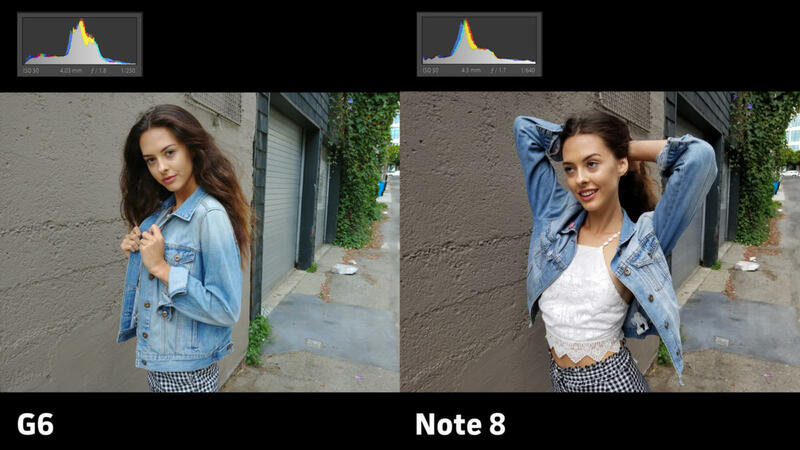 That’s because the Note 8 struggles with white balance just like the S8 did earlier this year. It’s not as bad this time around, but it still falls short compared to the G6, which captures a pleasing and natural color palette. And here we see the worst of the Note 8, with the model's skin tone looking almost cartoonish. 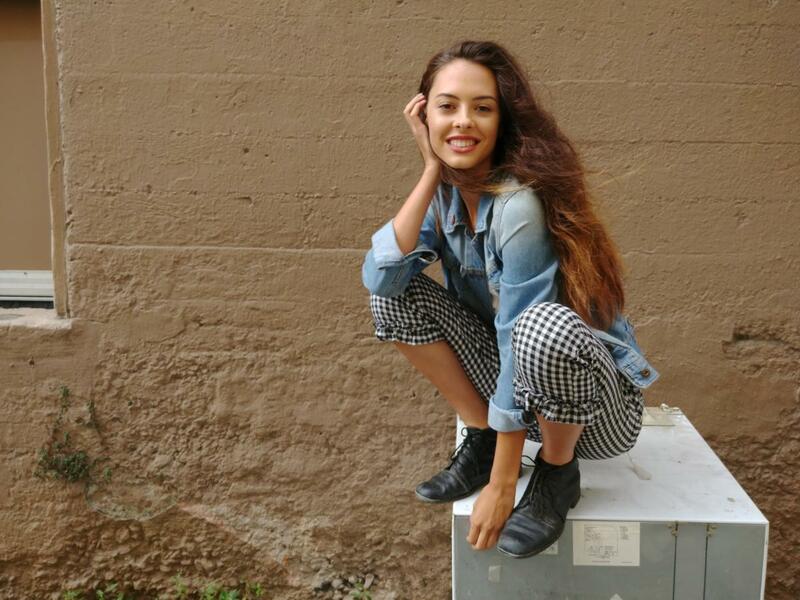 The most extreme example shows up in the above photo taken on a street corner. 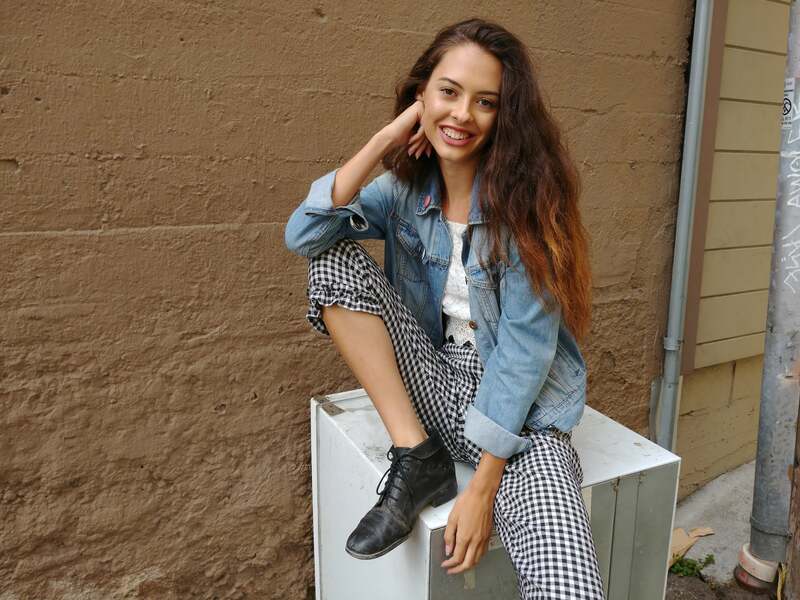 I can confirm that Cyndal was not sick during our test, it’s just the Note 8 having some problems. So, while the G6 didn’t score a huge win, LG still takes the color category. Next up is clarity. What I’m studying here is the sharpness of each photo across the entire frame, as well as how sharp each camera stays in various lighting scenarios. Both phones are sharp enough in brightly lit scenes. 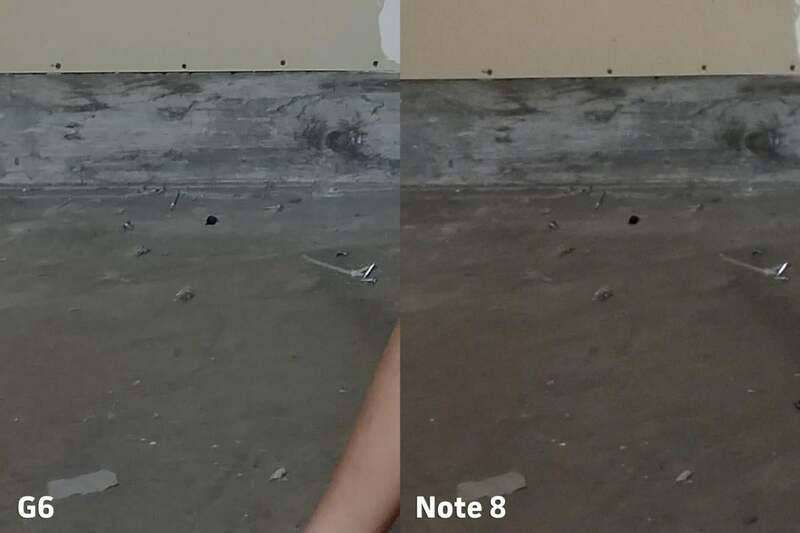 Zooming in on the corner of the frame we see some ghosting on the Note 8. Almost all lenses struggle at the edges so it's not cause for alarm. Click photo to enlarge. In bright lighting scenarios like this one, both cameras are nice and clear. 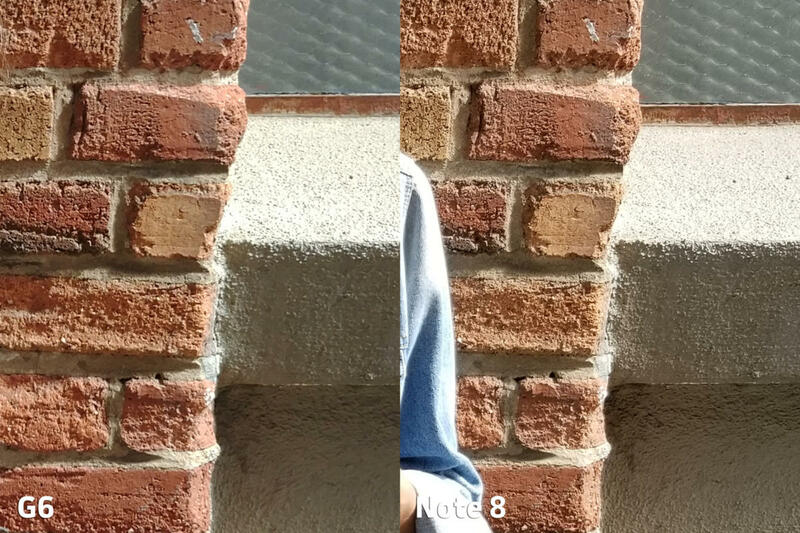 There is a bit of ghosting towards the edge of the Note 8’s frame, but it’s nothing major. Brick is always a great test of sharpness due to its fine texturing. Once again both hold up at full frames. 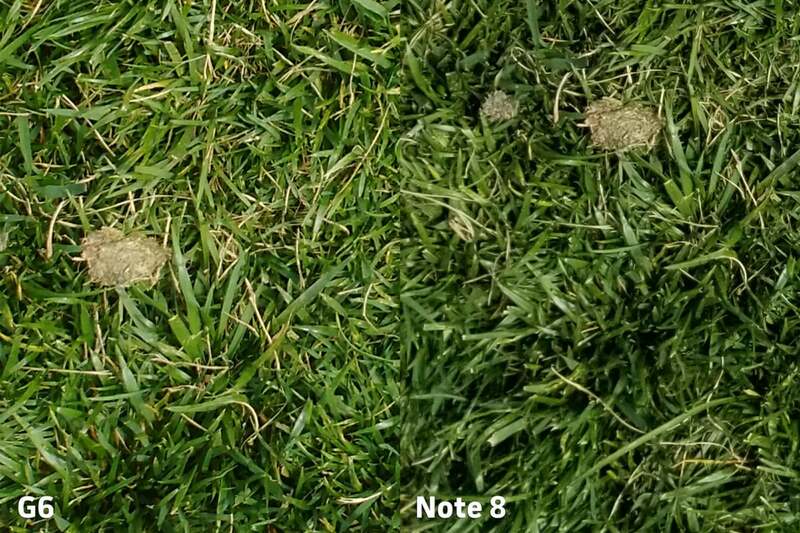 LG is known to add plenty of sharpening in post but the tiny details of the Note 8 are worse here. Click photo to enlarge. Against this brick wall, each camera performs great as well, but we start to notice that both have plenty of sharpening applied in post. This basement shot really tests the strength of the OIS systems' ability to keep the photo sharp during longer shutter scenarios. Zooming in reveals more texture and tiny details present in the G6's photo. Click photo to enlarge. So it’s really a toss up until we get into some super low light situations. The Note 8 performs admirably, but LG’s superb OIS kicks in and helps the G6 pull ahead. Noise in low light shots don't kill a shot for me—sometimes I prefer a bit of texture to a scene. Because there is less noise reduction applied to the G6's image, you can make out a bit more detail on the URL. Click photo to enlarge. The G6’s image is noisier in most shots, but that allows it to retain a bit more detail, like the website URL. 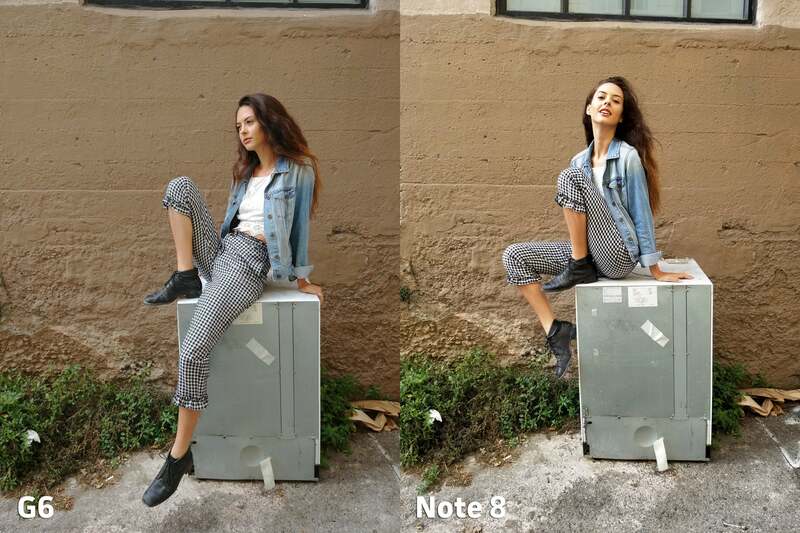 It's worth noting that the S8 won this category in its camera showdown, but every scene presents a different lighting challenge, and this time the LG G6 emerges victorious. The next test is exposure, and here we’re looking over the dynamic range of each camera and how it chooses to expose for a scene. 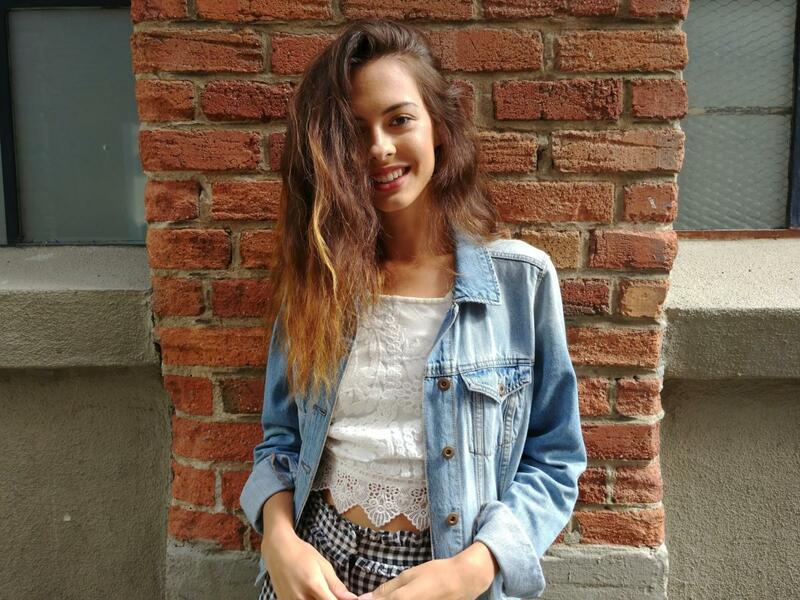 A fairly straighforward shot against this brick wall reveals a bit of whats to come. 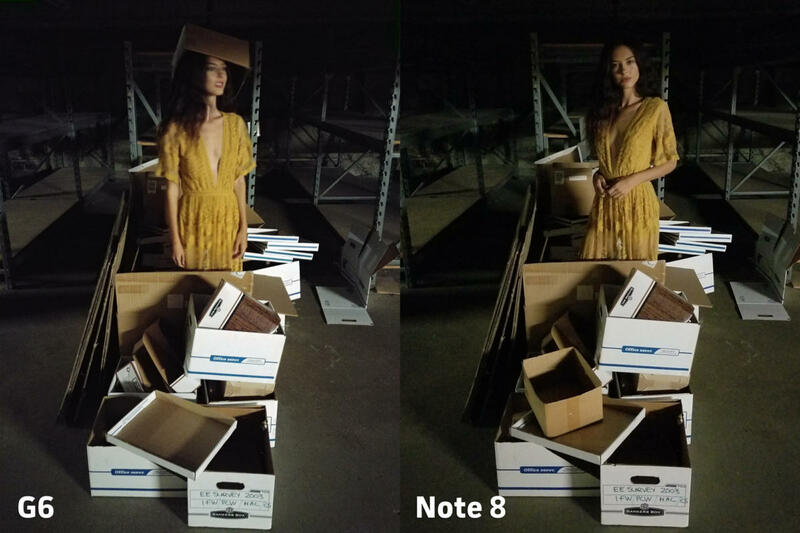 The Note 8 consistently underexposes compared to the G6. 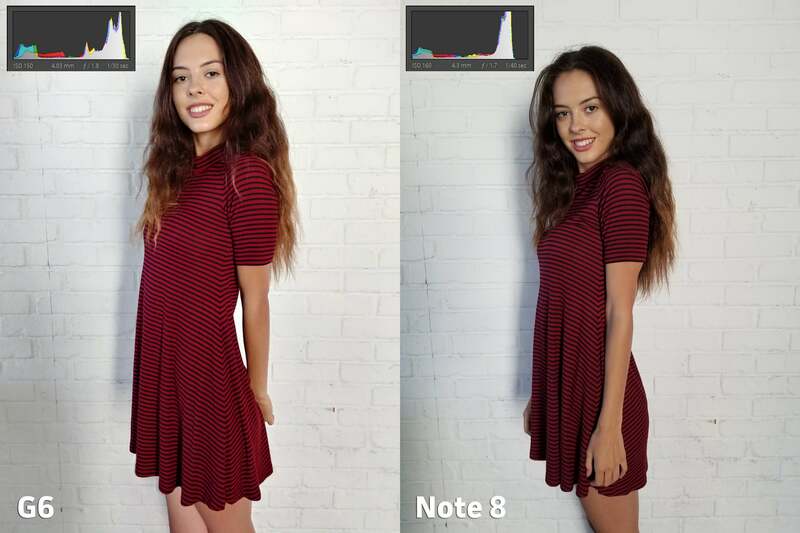 A peak at the Note 8's histogram shows that there is information starting to be lost in both the shadows AND the highlights. 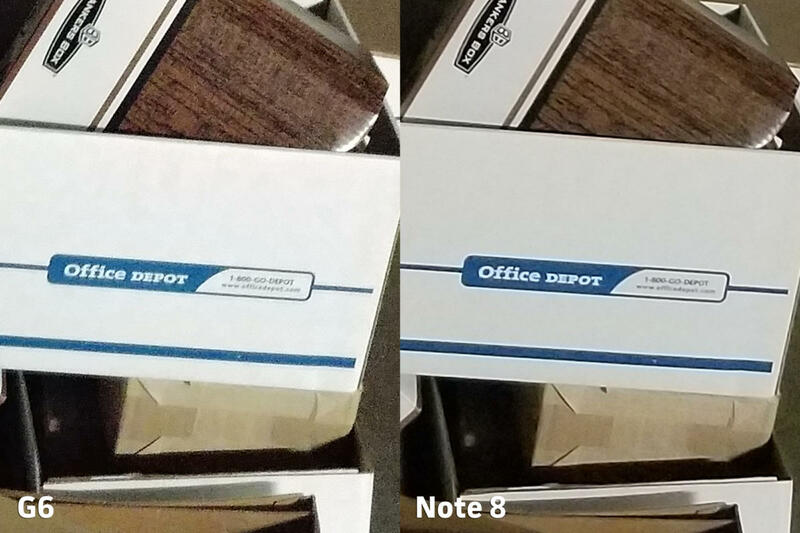 Yet another example of the Note 8 slightly underexposing compared to the G6. 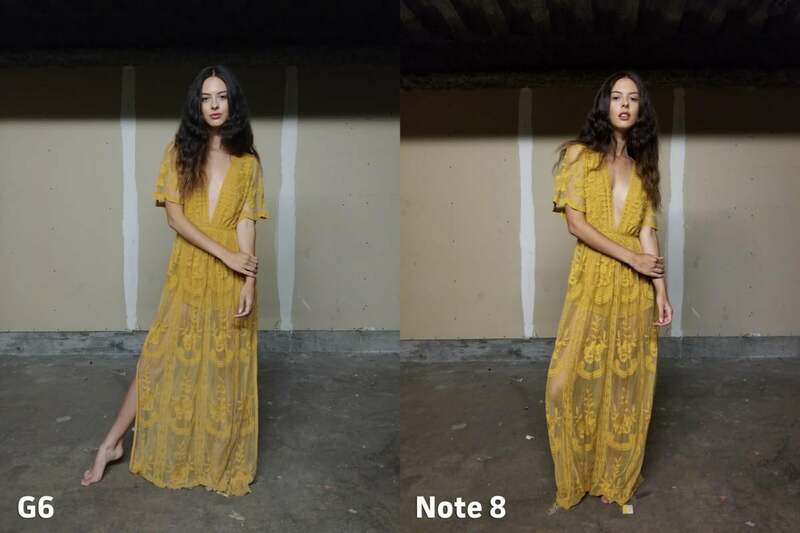 Overall, the Note 8 tended to underexpose scenes compared to the G6. This is interesting because earlier this year the S8 was overexposing compared to the G6. Underexposure is a safer tactic, especially when dealing with high contrast scenarios, but it still didn’t help the Note 8’s chances. In almost every situation, I was able to pull more information out of the shadows and highlights from the G6. The G6's HDR did not fire in this situation, resulting a washed out image. Now don’t get me wrong, the Note 8 isn’t way off the mark when it comes to exposure. It’s just that the G6 nails it almost every time. The only place where it continues to stumble is in knowing when to use HDR. Backlighting a scene is one of the hardest situations for a camera to figure out, and the G6 typically doesn't do a great job at it. In this super high-contrast environment, the G6 went between HDR on and off, not every really nailing it. Despite that, the LG G6 still takes the exposure category. And now to our last category—user experience. 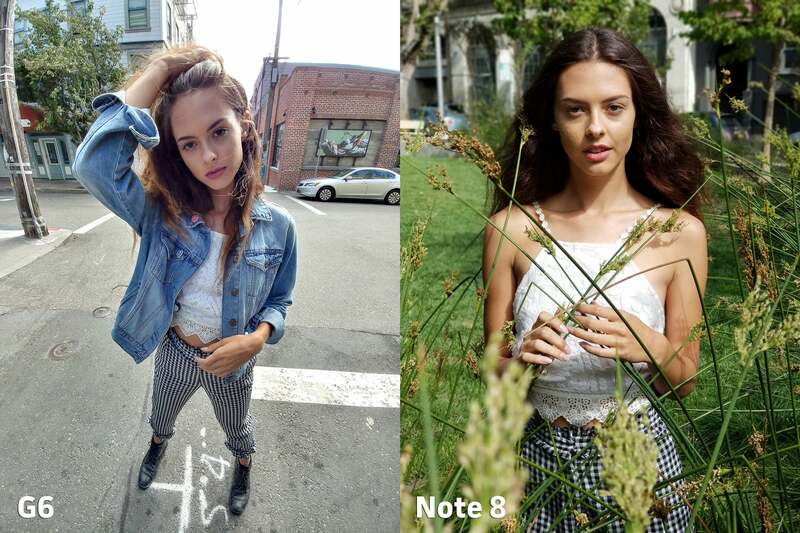 Here we go over all of the other variables of using these phones to take photos. In terms of camera app speed, I’ve always been impressed with how quickly I can launch Samsung’s default camera. The G6’s stock app is starting feel a bit sluggish, but I've been using this phone for months without a hard reset, so I won't ding it for that. The extra features in LG's stock camera app are super fun, like the ability to make a photo using both lenses. As for features, I’ve always loved what LG offers in its stock camera app. From including a histogram in its manual mode to its creative options for the dual camera setup, the G6 is packed with extras and makes Samsung’s app feel under-featured. 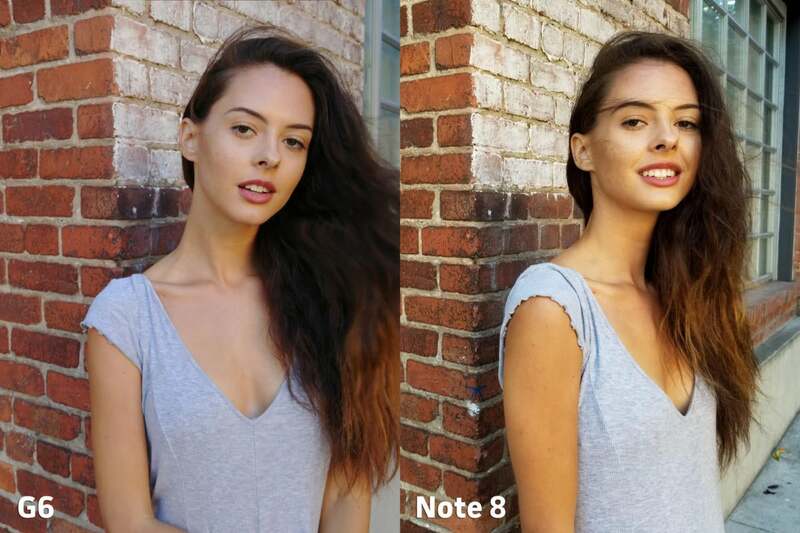 There are so many different ways to access the features in Samsung's stock camera app. It can get confusing. Some of Samsung’s features are activated by a press, while others are activated by sliding out from the edge of the screen, while even more are buried in menus. It’s not bad, it just feels like a phone experience instead of a camera experience—which is what you get on the G6. Samsung and LG both include dual lenses, but with dramatically different intent. Samsung and LG also choose to take vastly different approaches for their respective second cameras. Samsung went with a telephoto lens while LG stuck with its super wide angle lens. 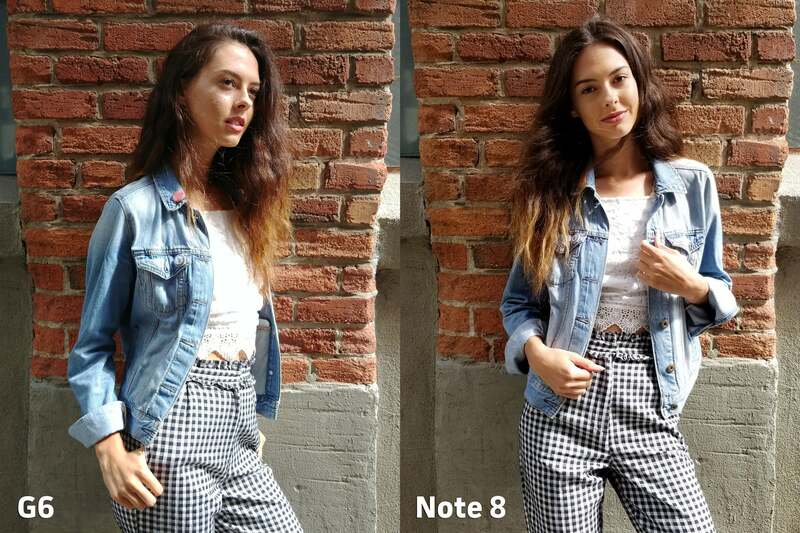 I actually found plenty of uses for each style—the most notable being the Live Focus mode on the Note 8. 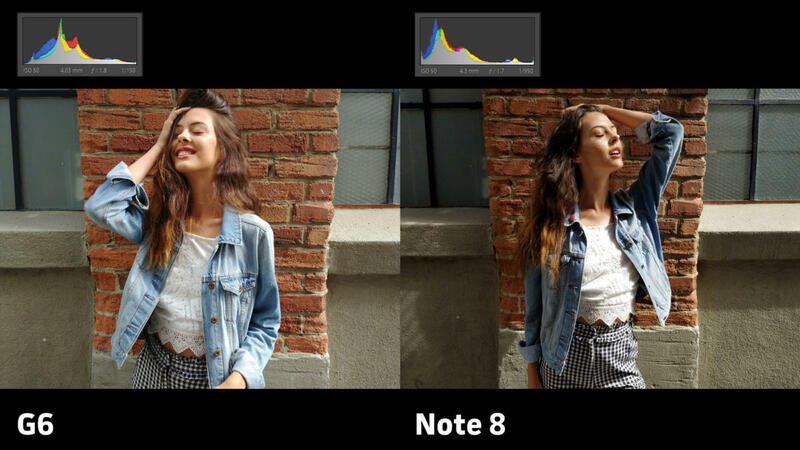 This mode introduces bokeh, or blur, to a photo taken with the telephoto camera, and the results are gorgeous. Samsung's Live Focus mode is great when shooting portraits, but I found the wide-angle camera on the G6 to be more useful in day-to day-situations. On the other hand, I found myself needing the wide-angle len of the G6 more often in real-world scenarios. 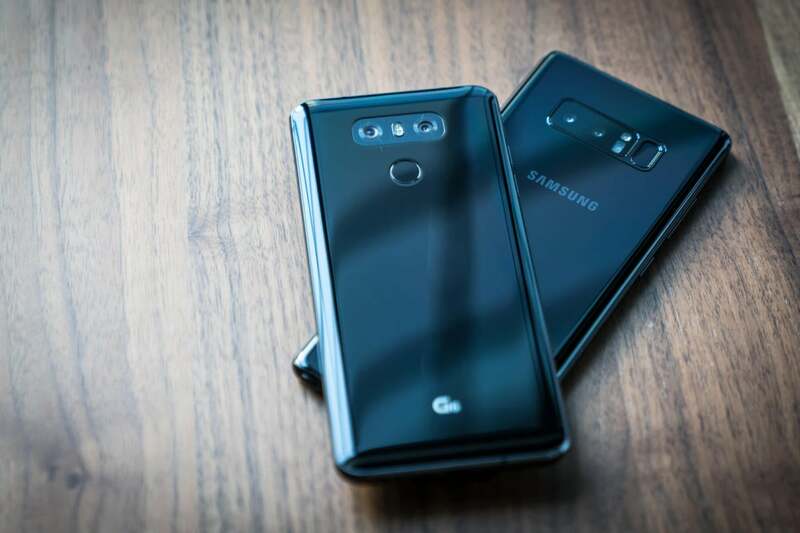 So this choice really boils down to personal preference: Both dual-camera systems are super useful, but I missed having LG’s wide lens more often than than I missed Samsung’s telephoto lens. All in all, using the Note 8 is a great experience and offers some great advantages over the G6. But in the end, I continue to love using the LG G6—so that’s the camera taking the win in user experience. While Samsung has made some improvements to the Note 8 that help it top the S8, it’s still not enough to take down the powerhouse that is the LG G6. LG’s G6 features modest specs, but really shows its strength in post processing. 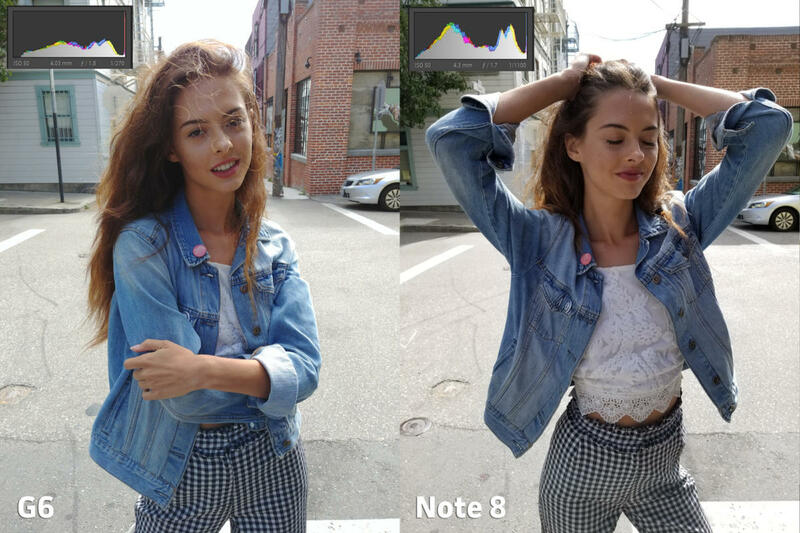 Photos taken with the G6 feature natural and lifelike colors and clear and crisp scenes, and maintain enough dynamic range so you can edit the photo later in Instagram. Pair that with LG’s superb stock camera app and wide-angle second lens, and you have a phone that has yet to be beaten. And what a year the G6 has had so far. After taking down the Google Pixel, it went on to defeat the Samsung Galaxy S8, HTC’s U11, and now Samsung’s Galaxy Note 8. We already have a preproduction model of LG’s V30 in for testing, so stay tuned for that showdown once we get the final version in. In the meantime, check out a few more full-size examples of what the LG G6 is capable of!